"You know what true greatness is? It's knowing when to get off." 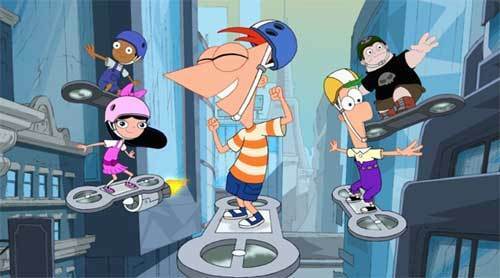 Well, tonight -- after 126 episodes, five one-hour specials, and a Disney Channel Original movie -- Phineas and Ferb are heading for the exit. Not because anyone in Mouse House upper management decided to pull the plug on this Emmy Award-winning animated series. But -- rather -- because Dan Povenmire and Jeff "Swampy" Marsh (i.e., this show's creator) decided that it was time. "Look, without naming any names here, we all know that there have been TV shows that overstayed their welcomes, who did themselves a real disservice by hanging in there a season or three too long," Povenmire said during a recent phone interview. "And we just didn't want that to be the case with Phineas and Ferb. We didn't want our show to be one of those that wore out its welcome. We really wanted to go out strong. Shut down production while people were still fond of the show and its characters." "Besides -- in the animation world -- it's just so rare that that a show actually gets to do a finale," Marsh stated. "Which is why we feel so honored and privileged that Disney allowed us to do this." And given that Phineas and Ferb has always talked about making the most of those "104 days of summer vacation," it's entirely appropriate that this show's finale (which airs tonight on Disney XD and simulcast on Disney Channel at 9 p.m. ET/PT) is entitled "The Last Day of Summer." Ah, but thanks to Dr. Doofenshmirtz' latest invention -- the do-over-inator (and Candace's determination to bust her brothers) -- tonight's episode is really the last day of Summer by way of Groundhog Day. 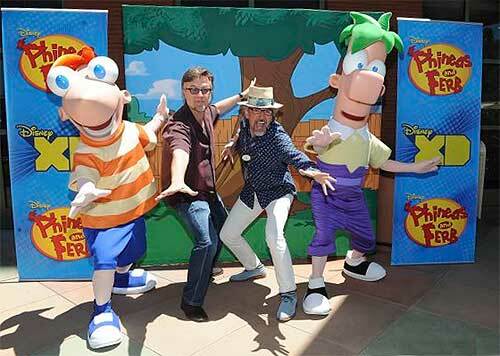 "For a couple of years now, we've been thinking about how we should bring Phineas and Ferb to a close. And then somebody pitched the idea of the show doing its own version of Groundhog Day. And I thought that that was perfect. Because that's what Phineas and Ferb would do if they could. They'd find a way to artificially extend that very last day of Summer," Dan admitted. "So we just took that idea and ran with it." And to make sure that this particular episode of Phineas and Ferb was a true celebration of the show, Povenmire and Marsh pulled out all the stops. They used every asset at their disposal to make sure that this finale was a genuinely memorable one. "Take -- for example -- the opening number for 'The Last Day of Summer.' We had built a 3D model of Phineas and Ferb's neighborhood for "Night of the Living Pharmacists," which was this episode of the show that we did back in the Fall of 2014," Swampy admitted. "Dan remembered that we had this asset and said 'We've got this cool 3D neighborhood. Why don't we start the show off with a big musical number where the kids fly hover boards all over the neighborhood?' And that turned out to be a really fun way to kick off the finale." And while Marsh and Povemire deliberately tried to craft the sort of celebratory send-off that the fans of this Disney Channel/Disney XD show expected, at the same time, Dan and Swampy wanted to use this series finale as a way to pay tribute to some of the very talented people who helped to make Phineas and Ferb possible. Which is why -- if you watch tonight's episode closely -- you can briefly glimpse the faces of Vincent Martella, Thomas Sangster and Alyson Rae Stoner, the real-life performers who voice Phineas, Ferb and Isabella Garcia-Shapiro. 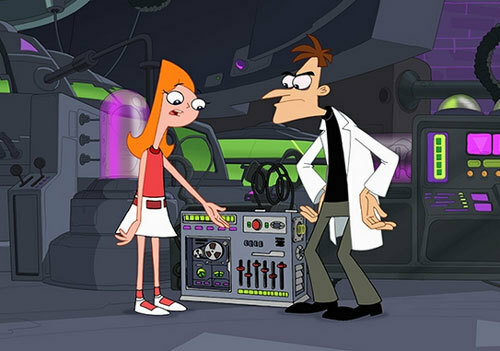 Given how ambitious and involved this particular episode of Phineas and Ferb was, it took a number of months for "The Last Day of Summer" to make its way through the production process. Povenmire and Marsh weren't actually able to deliver this show to Disney 'til just before Christmas 2014. "Which made for kind of a blue Christmas. I remembering spending a lot of this past holiday season talking with my wife about Phineas and Ferb," Swampy said. "I mean, Dan and I spent the last 10 years of our lives working on this show. So it was a really big deal -- for me, anyway -- to finally be letting go of these characters." Mind you, what's kind of ironic about all this is -- over these past few weeks, as Povenmire and Marsh have been doing interview after interview looking back on Phineas and Ferb -- they've also been hard at work on Mikey Murphy's Law, a new animated series for Disney XD, which should debut sometime in early 2017. "And what's really cool is that -- in my mind, anyway -- Mikey Murphy just lives a couple of neighborhoods over from Phineas and Ferb," Dan said. "And given that these two animated series will have a similar sort of look and design... Well, who knows? If Mikey Murphy's Law is successful, maybe a few years further on down the line, we could do a crossover episode where the Mikey Murphy characters get to interact with the Phineas and Ferb characters. I'd love to get the chance to do a show like that." So given that the idea for a Mikey Murphy's Law/Phineas and Ferb crossover is already out there, tonight's finale may not be quite as final as we think. Especially when you take into consideration that Disney has The O.W.C.A. 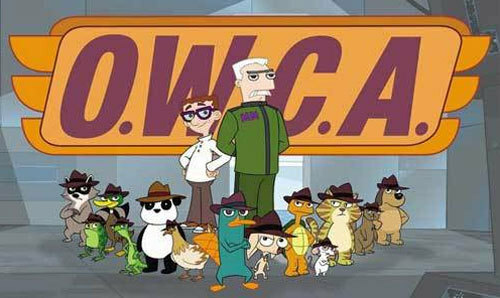 Files -- which is this hour-long special that focuses on Agent P and his fellow animal agents -- scheduled for this Fall. But even so, there are going to be some very blue Phineas and Ferb fans when "The Last Day of Summer" airs tonight on Disney XD and simulcast on Disney Channel at 9 p.m. ET/PT.